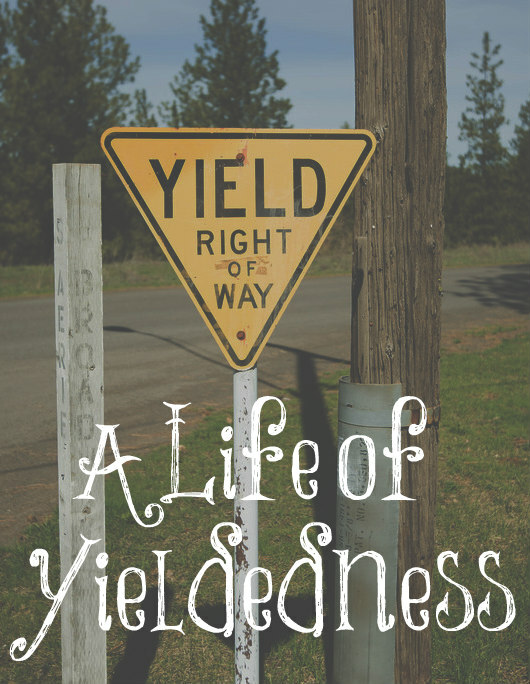 Do you live a life of yieldedness? Do you not care if you don’t get your own way? Do you live to please others instead of yourselves? Do you first see that people around you are served before you serve yourself? Do you live to be served or to serve? There’s a great article about how the Amish raise their children and most Christian parents would do well to learn from them. From what I have seem, most “Christian” children are not being raised to be unselfish and yielding. Our culture promotes the opposite: independence, selfishness, and life is “all about me” attitudes. These are completely contrary to what Christ calls us to be. “The Amish believe that the quickest way to spoil a child is to let them to have their own way.” The sooner a child learns that life isn’t all about them and their wants, the happier they will be. Selfishness never leads to happiness or contentment. This is why having large families is usually healthier for children. They learn to share and yield to others. “Children are taught from the Bible ‘Obey your parents in the Lord for this is right. '” Yes, it’s the parents responsibility to teach, train, and discipline your children in the ways of the Lord. The sooner they teach their children to obey and respect them as their authority, the easier it is for them to obey and respect the Lord as their authority. The one thing the article lacks is the importance of teaching children that the joy of the Lord is their strength. There must be a lot of smiles, hugs, and laughter in a home as well. If the home is somber and lacks joy, the children will grow up to be more attracted to the world and its ways, rather than to Christ. As parents, you need to show your children that living for the Lord is the very best thing in the world. They NEED to see your love, joy, and excitement for the Lord. Children must also see parents who live lives that are yielded to the Lord and to others. They must see mothers who are yielded to their father’s authority in the home. They must see mothers who yield to the Lord’s ways and seek to please Him in all they do. They must see mothers who love to serve and love others deeply. This will make a huge impression upon their lives. Don’t allow your children to get their own way since this will lead to destruction. The flesh is controlled by the old man and its tendency is to chose selfishness and the wrong path. Teach your children who they are in Christ and obedience to Him and His ways; for this will benefit them all throughout their lives. When they are old enough, make sure you take them slowly through Romans 6 – 8 so they will understand that they have been crucified in Christ and it is no longer they who live but Christ who lives within them. Then they will walk after the Spirit as a new creature in Christ! My mother was always yelling and nagging (she had a lot of petty rules). That was (and largely still is) her main communication method in the family (not with strangers, of course). I was seriously grateful that she had a job, so we could spent some time at grandma (or be alone at home as teenagers) and having a break from yelling and nagging. I wished that she could work longer hours instead of having most afternoons free. I used to hate summer holidays because she was home all day long. This is partly the reason why in my early 20s I seriously strayed from the church and its teachings. Unconsciously I associated the church teachings with her discipline and I craved freedom from yelling and micromanaging. I followed the world (I remained teetotaler and pro life, but that’s it). I am lucky that nothing bad happened to me. Later on I met my husband and after a short cohabitation we got married (in our mid 20s). My husband has not had any Christian upbringing, at the time it didn’t matter to me at all. Since becoming a mother I have been slowly but surely coming back to the faith of my childhood, strengthened and ripened by mistakes and experience. I’m committed to be different. I’m sure I will make plenty of mistakes (there is no such a thing as a perfect parent) but I don’t want to yell and nag. Wonderful post! I have always been interested in the Amish and would love to visit them one day. There is a lot they do that i agree with but a lot that i disagree with too.